One of the most accessible places for open-water swimming, Fenit beach is just a few minutes’ drive from the town of Tralee. This is a very popular area for swimming, as it is a sheltered spot and perfect for a swim along the shore. This is a Blue Flag beach with lifeguards during the summer, parking, toilets, and a play area nearby. Peddlers Lake is a beautiful corrie lake, located near the Conor Pass. You will need to climb for about ten or 15 minutes to get there, but it is well worth the effort. The water in Peddlers is clearer than most lakes and is fresh and invigorating. Be careful getting in because the rocks can be slippery. Knightstown harbour is a great place for a clean, safe swim. There are pontoons you can swim beside, and, unlike most harbours, the surroundings are very scenic and not overcrowded with boats. 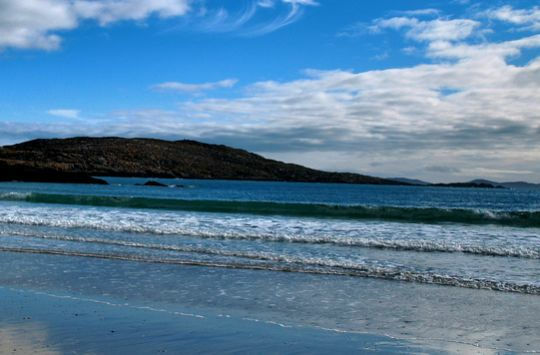 Derrynane beach is a beauty, whether you swim or not. If you are swimming, avoid the area marked by warning signs for dangerous currents – stay in the area where the lifeguards operate (summer only). If you do, you will enjoy a delightful swim across lovely, clear sand, with lots of places to walk and explore afterwards. Check out these water safety and swimming events in Kerry this summer.